It’s never too early to encourage imagination and a life-long love of books, ideas and creativity! 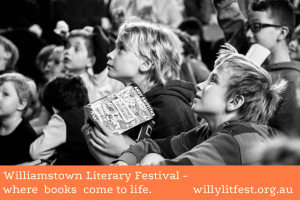 Join us at Willy Lit Fest with your little ones, your youngsters, and your teens. 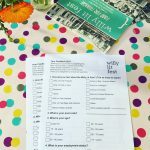 Story time with Hobsons Bay Libraries – Williamstown Library. Saturday 16 June at 10.30am to 11.15am. Free, no booking required. Songs, stories and activities for pre-school children over two years old. Kids will love meeting bestselling author, Jacqueline Harvey when she talks all things Alice-Miranda and Clementine Rose in this interactive session which will have the audience laughing out loud. Come along and hear all about the newest adventure in the series, Alice-Miranda in Scotland, with lots of madcap characters and old friends too. See what’s next in store for Clemmie as well. More information. Interested in science, in art? Curious about comics, drawing, and how art and science can combine to tell great tales? Creativity, collaboration, comic style illustration, & sensational science come together with microbe mayhem & magnificent stories of scientific discovery. Great for young folk from around 9 up, teens, adults & anyone with a keen sense of curiosity! Join Sarah L’Estrange as she wrangles a panel of wildly talented writers, illustrators and scientists who use the graphic novel and comic book style to bring science to life. Lorna Hendry and Bernard Caleo (How to Win a Nobel Prize written with Barry Marshall) together with Dr Gregory Crocetti and Ailsa Wild (The Invisible War – a Tale on Two Scales) will tell us and show us how they do it! More information. Kamishibai or ‘paper theatre’ is a Japanese street storytelling art using picture cards framed in a wooden box or stage. Popular in the 1930s, the storytellers mounted their stages onto bicycles and delivered stories to children. With the advent of television, kamishibai became less popular and the storytellers applied their talents to manga and animation. Now, kamishibai is enjoying a revival around the world. At the Williamstown Literary Festival kamishibai storytellers are gathering for the first time in Australia! Kamishibai for Kids brings talented storytellers together to share stories from their beautiful home-made stages. Anna, Dani,Tetsuta and Jackie have songs and rhymes and will introduce a little mischief and mayhem. Participatory in nature, kamishibai engages the hearts and minds of all. Come and be entertained and inspired by this gentle and intimate way of sharing stories. More information. Come on a tour of the treehouse with children’s author, Andy Griffiths. All questions will be answered, (even the silly ones). Andy will be signing books after his talk. Expected to sell out quickly – bookings essential! More information. Spies, Lies and Mysteries: Meet Kensy and Max! Ever wondered what it takes to be a spy? Jacqueline Harvey reveals how to be a successful sleuth and the inspiration behind Kensy and Max, the exhilarating story of 11-year-old twins born into a life of secrets, danger and intrigue. She will test your spy skills and give readers a sneak peek at the second book in the series which will be out in September. Hear about what inspired this thrilling, action packed world and make sure that you’re ready with lots of questions too. More information. When you spread your picnic rug under the golden elm in the Williamstown Botanic Gardens, do you ever ask the question: how did this and other exotic plants come to be in Australia? Storyteller, Jackie Kerin and musician, Sarah Depasquale, believe that it’s quite possible that the answer lies in a simple invention built in London in 1833. Join them as they take us back in time with The Amazing Case of Dr Ward and Other Stories to meet a curious fellow who created an invention that changed the world! The Amazing Case of Dr Ward and Other Stories is forty-five minutes of pure storytelling and musical magic for the whole family from the local duo who also created Tales from the Flyway celebrating the miracle of shore bird migration from Hobsons Bay to the Arctic tundra. A not to be missed performance! More information.